Sony PRS 505 Review – Sony first started delving into the eReader market all the way back in 2003, but it wasn’t until 2007’s Sony PRS-505 that they really turned the page, so to speak. This model is very portable, since it is the same size as a paperback novel, and it has Sony’s sleek, modern look, making it the thinnest (1/3 of an inch) of the eReaders. Sony PRS 505 Reader sets the modern standard in eReaders. This device heralds a huge leap in graphics. Furthermore, you are sure to enjoy the high-resolution, high-contrast, electronic paper display. This feature delivers a very realistic print look that is almost like traditional paper. The technology used (eInk) consumes minimal battery power. If your eyes are strained and your head aches after looking at the LCD screens ubiquitous in cell phones and similar devices, then this will help soothe your pain and forever eliminate daylight screen glare and squinting. The high quality contrast and resolution allows you to read at the same quality of a standard paper book. 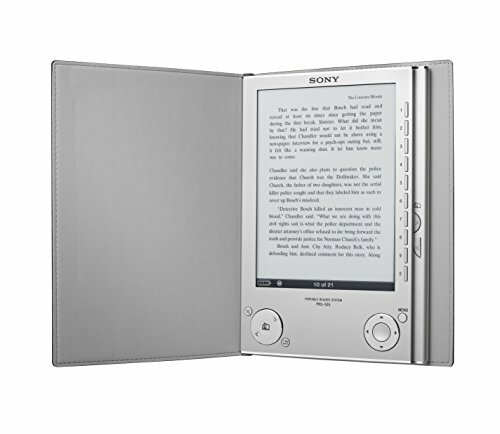 The Sony PRS-505 Reader can become a virtual, portable library, with a 160-eBook capacity. The gadget’s library possibilities would be better if there were expansion slots for Memory Stick Duo or SD memory cards. Users who want more advanced capabilities will like that with the new USB storage, you can move documents, images and other files to your reader. On the upside, this eBook holds thousands of titles. It features a great high-contrast screen that rivals the readability of the printed page. This device is easy to read in bright environments. There are some notable performance and design improvements in comparison with the 1st generation model. You will surely appreciate the 128MB internal memory that supports more available memory via SD & Memory Stick Pro expansion slots. It is easy to adjust font size with just the touch of a button. The battery lasts a good, long while. The device displays PDF & Word files, and it can also play MP3 files. On the downside, titles that can be downloaded are quite expensive. Furthermore, they are only available via Sony’s online store. The AC adapter is an optional accessory. You can charge the Sony PRS 505 Reader by using the included USB cable and connecting the device to your computer. Mac owners do not have access to the desktop software. It’s hard to read PDF files because of the tremendous amount of reduction necessary to make them fit the screen. Unfortunately, it’s not possible to magnify or zoom them. Even though lag issues have been addressed, some remain during page flipping. Audible audio books have no support features. Fun and simple to make use of Its lightweight and you will hold a lot of books within the interior Sony PRS 505 remarkable e-ink technology. It reads like a a genuine book It’s possible to enlarge Fonts. Has a excellent function to import Word documents, more so since almost everything online can be copied and pasted into Word format. Sony PRS 505 access to a large selection of ebooks but more often the list doesn’t always come up with the correct titles. Contains very small selection of professional, textbooks, or academic ebooks. Itsability to read PDFs is a plus, however, you can’t browse the contents since you have no functionality to zoom in it. So, it’s more useful for storage than for reading. Sony PRS 505 reader has definitely made its mark in the e-book world along with the Amazon Kindle, iRex , Bookeen Cybook and BEBook. Is it possible that this is the next phase for the e-book? The 2nd generation Sony Reader offers some great improvements over its predecessor. These include a consolidated physical design along with increased storage. However, the fact that Amazon’s Kindle offers more titles as well as wireless downloads over EV-DO might put off some readers. Nonetheless, Sony’s sleeker styling $100 lower price may well cause this to become a very popular model. The Sony PRS 505 shortened the size of the prior model by a few millimeters. It’s not even a half inch thick, which is thinner than most paperback books, and can easily fit in your backpack without any discomfort since it only weighs 9 ounces. The new brushed-silver design (you can also buy this in navy) as well as the camel-colored leather binding (pink and black are available, but cost $39.99 more) are impressive, and the binding is soft and lends a nice old-fashioned touch to the device. The 6″ LCD screen is rectangular. It is surrounded by a confusing and profuse array of keys. If you are holding the device in portrait mode, the 0-9 buttons run vertically up and down the right-hand side. They correspond with onscreen menu items and can be used to move to selected pages. You can change the pages by using the two additional keys next to them. Another page-turning button is located on the bottom left; the bottom right holds a menu button and 4-way toggle and center button, making for quite easy menu navigation. On the top is a power switch and a SD/Memory Stick Pro slot; on the bottom are the volume control, DC charging slot, mini-USB and headphone jacks. We didn’t run into any complications when downloading the Sony Connect software using the CD-ROM that was included. Sony Connect is a lot like iTunes in appearance and aesthetics, and it only took two clicks for our connected reader to receive books — although if you have a Mac, you’ll need to drag and drop the files yourself. The Sony’s online bookstore appears to be expanding its book selection and it now has over 20,000 titles. However, there is far less titles than the Amazon Kindle’s 90,000 books. The cost appears to be similar to the standard retailers. Nicolas Sparks’ The Choice, for example, was being sold for $10.19 and Malcolm Gladwell Blink was 7.99. All of the listed titles put on Amazon and Amazon Kindle are priced the same. With the Reader Scrolling through pages on the Reader took less than a second; while not immediate it was pretty close. The Magnify tool was very useful at changing the text size. There was no need to maneuver back and forth, because words would expand along with the page so the larger you make it, the more pages the book will have overall. We appreciate that the text formatted itself; this prevents you from needing to scroll all over the page. Sony PRS 505 is great for those individuals who prefer not to stare straight at the page when reading, as it has fabulous viewing angles. You have the option of looking at the display in either landscape or portrait mode. E-Ink technology involves microcapsules containing white and black particles that move in response to electricity. This supports this eReader in using very little power while maintaining a clear image onscreen. Sony promises a life expectancy of approximately 7,500 page views on a single charge. We read Wuthering Heights’ first 50 pages — after that, we had to quit — and the battery meter didn’t go down, but listening to MP3s (they sounded fine, by the way) at the same time used up much more battery life. Thanks for visiting us. Did you liked our Sony PRS 505 Review Reader ?